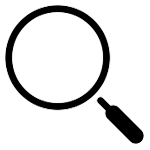 X1 Search provides users the fastest, simplest way to find and work with the exact information they need and thought they’d never find again. By providing the fastest access to their documents and email, X1 Search unlocks the potential for people to leverage years of experience with just a few keystrokes, dramatically improve productivity, and function at their highest level. Take a tour of the latest version of X1's award winning search and productivity application which simplifies the way business professionals search and act upon desktop files, remote file shares, emails, attachments, SharePoint data, and more. Stop searching, and start finding. 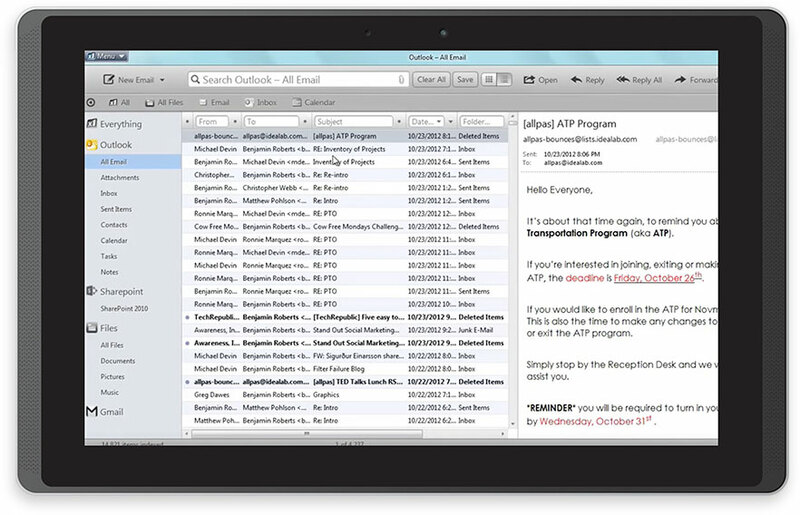 Take a tour of the latest version of X1’s award winning search and productivity application. Stop searching, and start finding. Enterprise search means different things to different people. 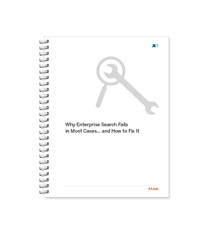 In this document, learn about the three distinct forms of enterprise search and how the various use-cases require the search engine, methods of analysis and workflow be specifically designed for the particular use case. Learn more about X1's newly released next generation productivity application for both standard and virtual desktops, unifying search across emails, files and SharePoint data. 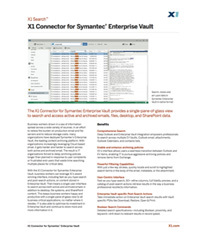 Learn more about X1's Connector for Symantec Enterprise Vault providing a single-pane-of-glass view to search and access active and archives emails, files, desktop, and SharePoint data. 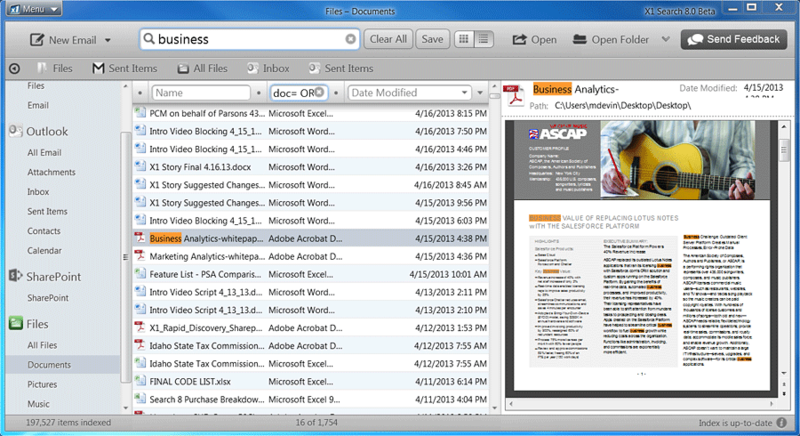 It is easy to find email, desktop files, remote file shares (e.g. 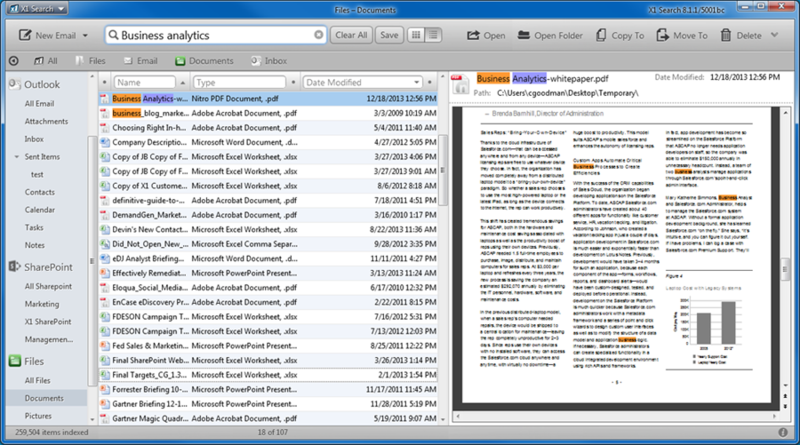 Box), SharePoint data and more in a single interface with hit highlighting and full-fidelity preview of results. 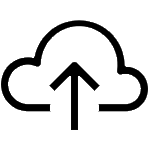 Search cloud repositories like Box and OneDrive alongside email, files, and SharePoint content, reaping the benefits of a single-pane-of-glass view for business content. 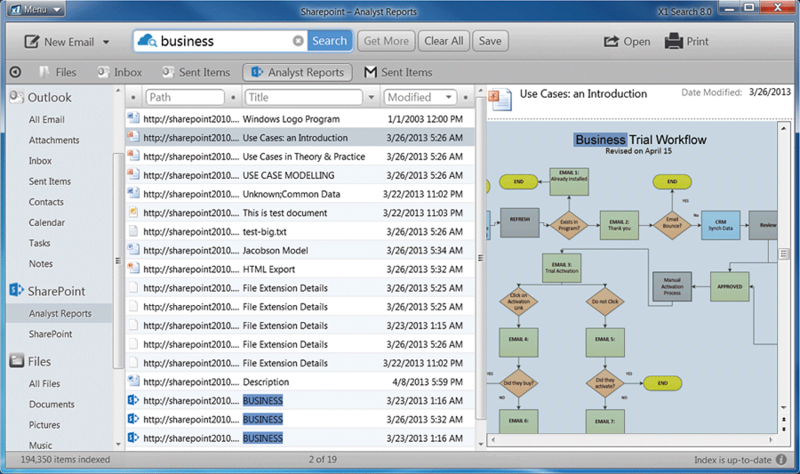 Deep Outlook and Symantec® Enterprise Vault integration empowers professionals to search across multiple Vaults, Outlook email, attachments, Outlook Calendars, and contacts lists. Seamlessly integrate SharePoint into your workflow with native preview of document libraries and lists as well as SharePoint specific post-search actions such as check-in and check-out. A single, unified interface with fast-as-you- type search, 50+ refine columns, full fidelity preview of attachments and files, and a catalog of post-search actions retrieve and act upon results in the way a business professional recollects information. 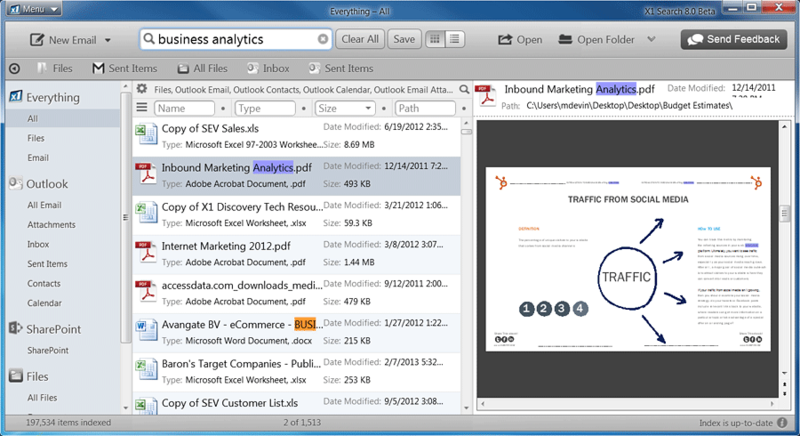 X1 unifies search results across desktops, network file shares, email, cloud sources (e.g. Box, AWS), and more, enabling you to preview and act upon information no matter where it lives. 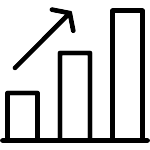 Our goal is to help you find answers to your product questions. 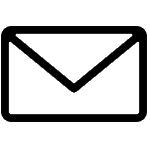 Outlook 2007, 2010, 2013, 2016, Gmail, Yahoo!, AOL, and other IMAP based email accounts. X1 Search supports Office/Outlook installs in both 32-bit and 64-bit modes. What applications are supported with X1 Search? What is the difference between the X1 Professional Client and X1 Search? Please note: With the release of X1 Search we made a change our licensing scheme, making it easier to distribute product updates and new releases. As part of this change, X1 Search requires you have an active internet connection to validate the installed license file, and Search “phones home” to our activation server once every 14 days. What are the minimum hardware requirements for X1 Search? *Actual memory and disk space varies depending on the amount of content indexed. Can I install Search on Virtual Desktops like XenDesktop or XenApp? 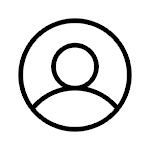 Yes, X1 Search Virtual provides X1’s robust search, architected for virtual desktop environments. 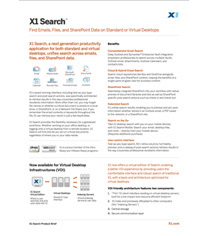 X1 Search Virtual is available for volume purchase only, so please contact sales directly for more information. Is X1 Search available on the Mac? While our product team is well aware of the desire and an X1 Pro Mac version is certainly part of our product development plans, no release is imminent at this time. 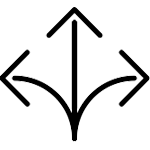 Our complete knowledge base can be found [here]. Join us for a webinar to see how to deploy enterprise search solutions in ways that make both end-users and IT departments happy. Vault past the popular concept of a single search bar and get faster results by using X1's refine columns - apply multiple criteria and get results faster! Maximize your SharePoint experience with X1 Search. Watch this video to see the significant advantages of X1’s best-in-market SharePoint search. Box has transformed the way we collaborate and share information. 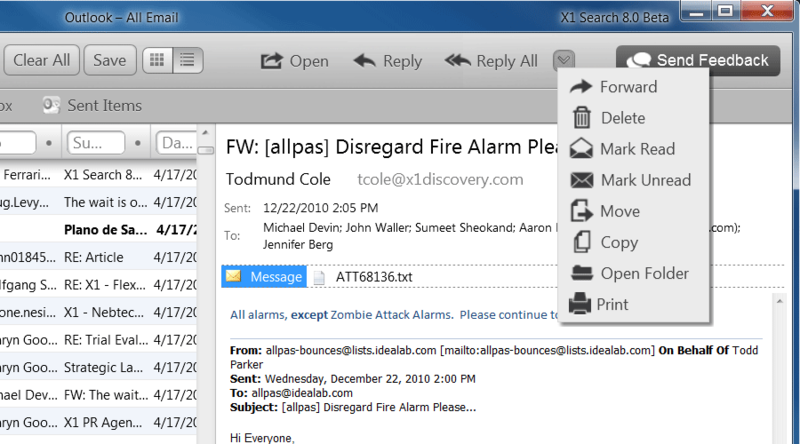 X1 Search offers a single-pane-glass for searching e-mails, files, attachments and Box. Our new ‘saved search’ and ‘saved search sharing’ functionality allows for collaboration and knowledge sharing across your team.